The Global Volcanism Program has no activity reports for Wells Gray-Clearwater. The Global Volcanism Program has no Weekly Reports available for Wells Gray-Clearwater. The Global Volcanism Program has no Bulletin Reports available for Wells Gray-Clearwater. The Wells Gray-Clearwater volcanic field in the Quesnel Highland of east-central British Columbia contains basaltic cones and lava flows of early Pleistocene-to-Holocene age. Pleistocene deposits include plateau-capping lava flows, subglacial mounds and tuyas, and hyaloclastites. Buck Hill Cone was erupted during the latest Pleistocene during the waning stages of the Fraser glaciation. 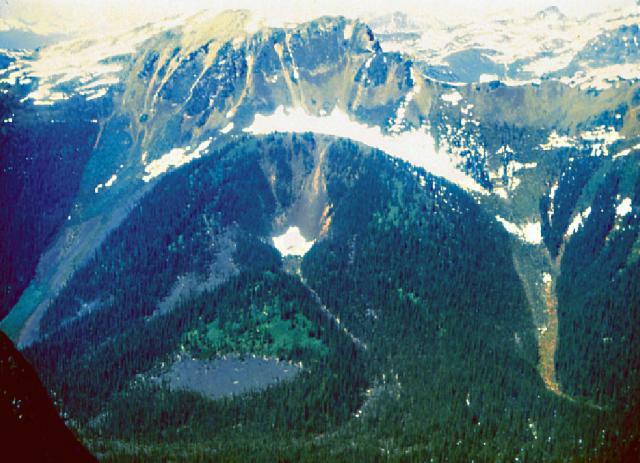 Holocene eruptions took place in the Spanish Creek, Ray Lake, and Kostal Lake areas (Hickson and Souther, 1984), forming cinder cones and producing lava flows that traveled up to 14 km. A lava flow from Dragon cone is radiocarbon dated at about 7,600 years ago, and flows from Flourmill, Kostal, and Spanish Lake Cones rest on glaciated bedrock without an intervening paleosol, suggesting an early Holocene age. The latest eruption took place from Kostal cone about 400 years ago (Hickson and Edwards, 2001). Campbell R B, 1961. Quesnel Lake, west half, British Columbia. Geol Surv Can Map, 3-1961. Campbell R B, 1963. Quesnel Lake, east half, British Columbia. Geol Surv Can Map, 1-1963. Campbell R B, 1967. Canoe River, west half, British Columbia. Geol Surv Can Map, 15-1967. Campbell R B, Tipper H W, 1971. Geology of Bonaparte Lake map-area, British Columbia. Geol Surv Can Mem, 363: 1-100. Davis N F G, 1930. Clearwater Lake area, British Columbia. Geol Surv Can Summary Rpt, Part A: 274-293. Hickson C J, 1986. Quaternary volcanism in the Wells Grey-Clearwater area, east central British Columbia. Unpublished PhD thesis, Univ British Columbia, 357 p.
Hickson C J, Edwards B R, 2001. Volcanoes and Volcanic Hazards in Canada. In; Brooks G R (ed) A Synthesis of Geological Hazards in Canada, Geol Surv Can Bull, 548: 1-248. Hickson C J, Soos A, Wright R, 1994. Catalogue of Canadian volcanoes. Geol Surv Canada Open-File Rpt. Hickson C J, Souther J G, 1984. Late Cenozoic volcanic rocks of the Clearwater-Wells Gray area, British Columbia. Can J Earth Sci, 21: 267-277. Holland S S, 1976. Landforms of British Columbia, a physiographic outline. Brit Columbia Dept Mines Petrol Resour Bull, 48: 1-138 (2nd printing). Metcalf P, 1987. Petrogenesis of Quaternary alkaline lavas in Wells Gray Provincial Park, B.C. and constraints on the petrology of the subcordilleran mantle. Unpublished PhD thesis, Univ Alberta, 395 p.
There is no Deformation History data available for Wells Gray-Clearwater. There is no Emissions History data available for Wells Gray-Clearwater. The Wells Gray-Clearwater volcanic field in the Quesnel Highland of east-central British Columbia contains basaltic cones and lava flows of early Pleistocene-to-Holocene age. Dragon Cone (above) produced lava flows that traveled 14 km down Falls Creek to the Clearwater River. Pleistocene deposits of the volcanic field include plateau-capping lava flows, subglacial mounds and tuyas, and hyaloclastites. Several cones were active during the Holocene, and the latest eruption took place from Kostal cone about 400 years ago. Photo by Cathie Hickson (Geological Survey of Canada). Large Eruptions of Wells Gray-Clearwater Information about large Quaternary eruptions (VEI >= 4) is cataloged in the Large Magnitude Explosive Volcanic Eruptions (LaMEVE) database of the Volcano Global Risk Identification and Analysis Project (VOGRIPA).